VeriCite DocumentationUser GuidesBrightspace User Guide LTI Content Item Integration - Instructor ArticlesHow do I delete a VeriCite report? Instructors may delete a student submission for an assignment. 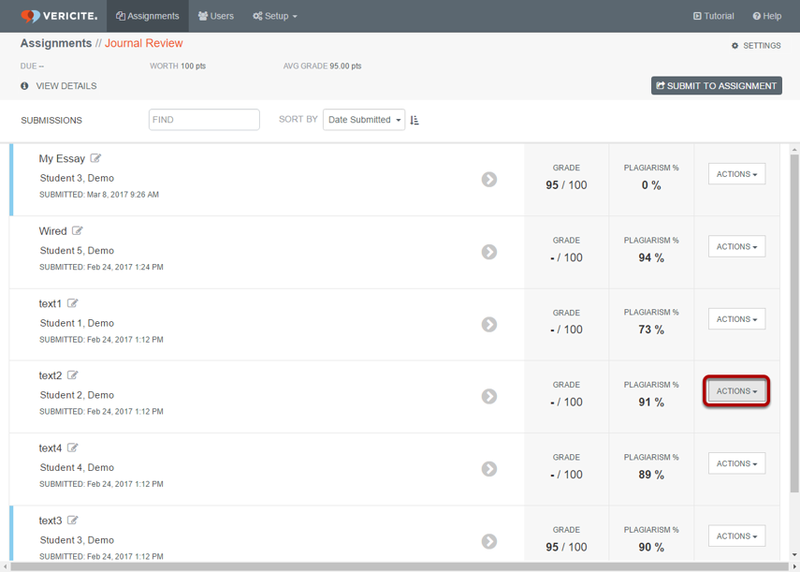 However, deleted assignments are not permanently removed. They will remain in the institutional repository and may be recovered by the instructor for the course if desired. See How do I recover orphaned VeriCite LTI submissions? for more information. Go to the Actions menu for the report you want to delete. Zoom: Go to the Actions menu for the report you want to delete. Select Delete from the drop-down menu. Zoom: Select Delete from the drop-down menu. (Optional) If you deleted an item in error, you may select Undo from the alert banner to recover the submission. Zoom: (Optional) If you deleted an item in error, you may select Undo from the alert banner to recover the submission. Next: How do I download a student's original file submission from VeriCite?